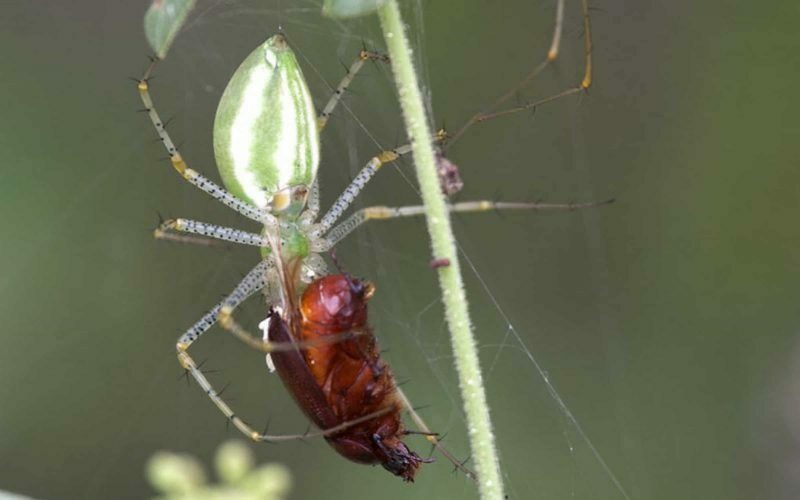 Unlike many spiders, it does not spin a web to trap its food. This beautiful creature is in the Phylum: Arthropoda, Class: Arachnida. The epithet, viridans is Latin for ‘becoming green’. This spider is found in the Southern part of the U.S., Central America, the West Indies and Venezuela. The body of the female is almost 1 inch long; the male more slender and about half that length. The animal has red spots on its dorsal surface and often a red patch between the eyes. It has 8 eyes (4 rows of 2). The Green Lynx is diurnal. The photo shows the underside of a female ingesting a meal and was taken in Sabino Canyon in September. Note the long black spines and black spots on the legs. The spines are likely helpful in holding onto prey since, unlike many spiders, it does not spin a web to trap its food. Because it hunts many species of moths and their larvae this spider has been used in crop pest control. However, it does not discriminate between pests and beneficial insects such as Honey Bees. Although usually bright green, a gravid female can change its color to match the surroundings. The female is very protective of her young. In September and October she may create several egg sacs each containing between 25 and 600 bright orange eggs. The eggs hatch in 2 weeks. After another 2 weeks the spiderlings come out of the egg sac and are guarded by mom. They pass through 8 instars on the way to adulthood, taking almost a year to reach maturity. The bite is painful but it rarely bites humans.